This article needs images! If you have any images of the things detailed in this page(ps3 trophy images), please add them to this page. 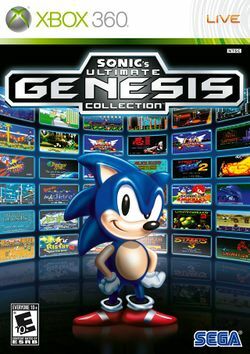 Sonic's Ultimate Genesis Collection is a compilation that collects various Sonic and Sega games from the past. One of the benefits of this compilation is that they includes a save states feature so that any game can be saved and loaded at any time. There are 34 achievements for the Xbox 360 worth 1,000 . There are 35 trophies for the PlayStation 3 consisting of one 4: Platinum, four 3: Gold, 13 2: Silver and 17 1: Bronze.